HC-One, the UK’s largest care provider, has joined forces with the GMB Union to launch Careforce, a new initiative to champion careers in care. Devised by the two organisations, Careforce has been prompted by a “triple-whammy” of what the pair calls increasing demand caused by an ageing population, low pay caused by inadequate funding arrangements and poor morale caused by relentlessly negative media coverage. They claim this is making it difficult for operators to recruit and retain the people required to provide the very best care to society’s most vulnerable. The Careforce initiative will work to secure the necessary support, progression and pay structures to inspire new joiners and retain outstanding staff by actively promoting and celebrating the benefits of a career in care. The organisations said the unprecedented partnership was significant – not just for the sector, but for everyone who may need care themselves, or whose loved ones require care, and aren’t able to receive the level of support they need. 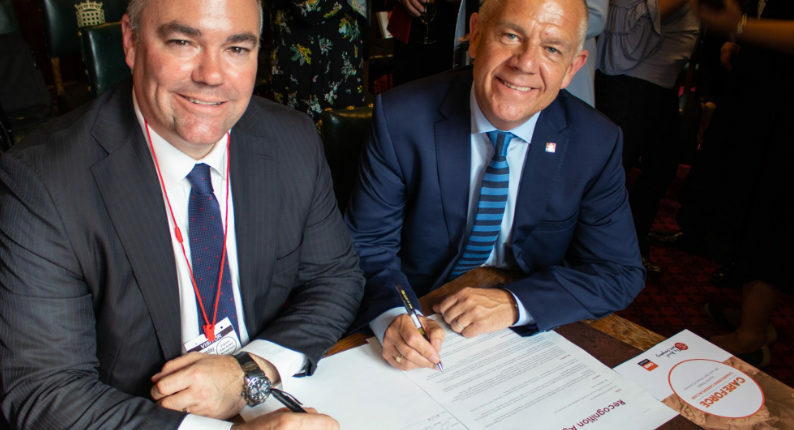 As part of the Careforce launch, which took place at the House of Commons yesterday and was attended by Care Home Professional, HC-One chief executive Justin Hutchens and GMB Union general secretary Tim Roache signed an historic recognition agreement between the two major UK organisations. The document signals a pact between the two to work together in ensuring the HC-One workers are fully supported, which will in turn ensure HC-One residents receive the kindest care. HC-One and GMB are now also calling for other stakeholders across the sector to give their backing to Careforce to help ensure that all of society’s elderly have access to a happy and motivated workforce of carers. Skills for Care Chair Dame Moira Gibbs and Director of Age UK Caroline Abrahams also lent their support to Careforce by speaking at this inaugural event. GMB general secretary, Tim Roache, added: “Care is crucial. For each of us individually, our parents, grandparents, kids, friends and neighbours, but too often the sector is overlooked and the people working in care treated less than the frontline professionals that they are.